Apple announced this morning it has partnered with the U.S. Department of Veterans Affairs (VA) to make the Health Records feature on iPhones available to veterans. The deal will allow the veterans to view their medical information across participating institutions, including the VA, organized in the Apple Health app. 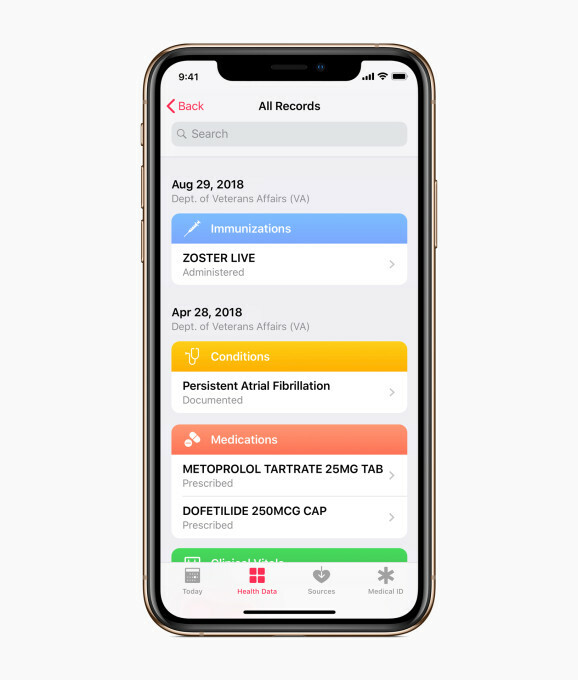 These health records include allergies, conditions, immunizations, lab results, medications, procedures and vitals, and will be displayed alongside other information, like Apple Watch data. This gives VA patients a more comprehensive view of their medical history and health data, Apple says. The medical information is also secured through encryption and protected by the iPhone user’s passcode, Touch ID or Face ID. Apple was reported to be in discussions with the Department of Veterans Affairs about this deal back in November of last year. At the time, it was said that in addition to the health record integration on iPhones, Apple would provide engineering support to the agency. The partnership is a big win Apple, as it provides the iPhone maker a means of reaching the over 9 million veterans currently enrolled in the VA’s system across 1,243 facilities. It also represents another success by the company in terms of getting health care institutions to support its health records feature on iPhone. Today, that list includes a growing number of hospitals and clinics , across the U.S.
A number of tech companies over the years have tried to offer platforms for centralizing health records, but have faced challenges because of the fragmentation across the industry as well as other technical challenges.